Fund managers expect mid and smallcap companies to show higher earnings growth. Fund managers expect mid- and small-cap companies to show higher earnings growth, given that most of their earnings come from the domestic economy. MUMBAI: The sharp fall in valuations of small-cap shares have prompted various domestic mutual funds to launch schemes that bet on such shares. 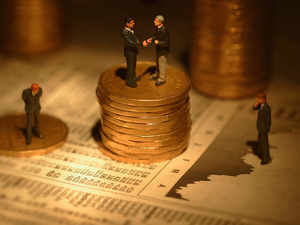 While Tata, Invesco and BoI AXA have mobilised money through new fund offers (NFOs), fund houses such as Edelweiss and Canara Robeco have lined up NFOs later this month, and IDFC has filed its document with the regulator. This category of equity mutual fund has received strong inflows in October and November last year. While small-caps received Rs 1,254 crore of inflows in November, large-caps got Rs 880 crore, and mid-caps Rs 1,016 crore. In October, small-caps got Rs 1625 crore, while large-caps and mid-caps got Rs 1,932 and Rs 1,080 crore, respectively. The inflows are despite investors incurring losses in this segment last year. The Nifty Smallcap 100 index is down 32.7 per cent in the past one year, while the small-cap fund category has lost 21.4 per cent, as per data from Value Research. The Nifty 50, on the other hand, is up 1.73 per cent. However, fund managers are positive about the prospects of this category of stocks, which is leading investors to put in their money. “The current divergence between performance of large- and midsmall caps is at historical extremes. History indicates that such divergences don’t exist for too long, and post such large underperformance, mid-small caps tend to outperform large-caps over the next 12-18 months,” said Pankaj Tibrewal, fund manager, Kotak Mutual Fund. “The small-cap index is currently at a large discount to the Nifty index. Valuations are reasonable and companies will show better earnings growth,” said Mahesh Patil, co-chief investment officer, Aditya Birla SL Mutual Fund. Post categorisation of mutual funds by the regulator, fund managers could generate higher alpha through investment in small- cap companies as they are least tracked by analysts. However, these investments can be volatile. Wealth managers caution investors on their investment in this space. Ïnvestors should not allocate more than 15-25 per cent to small cap and thematic funds. Given the volatility in these funds, investors should build their exposure via SIPs and have a minimum time frame of 7 years,” said Pallav Bagaria, director, Sapient Wealth Advisors.